Settimana ricca di commenti ed indiscrezioni pesanti riguardo Prince e la sua morte. Lasciamoli parlare. La cosa non ci interessa anche perché di dubbia provenienza. Troviamo più interessanti e divertenti le storie che si trovano in questo articolo pubblicato da swnewsmedia.com dove alcuni “vicini di casa” di Prince raccontano i loro incontri con la star. Avrebbe potuto vivere in qualsiasi parte del mondo, ma lui ha sempre preferito Minneapolis e precisamente la contea di Chanhassen che, tra le tante curiosità, si è classificata come il 4° miglior posto dove vivere negli Stati Uniti in una ricerca del 2013 fatta dalla rivista Money. Nell’articolo possiamo leggere chi lo ricorda per negozi, caffè o al parco di softball, chi per le donazioni fatte a strutture locali e chi per le sue passeggiate in bicicletta. C’è la storia di Jeff Peshek che gli ha venduto una moto e c’è anche chi dice che Prince per non cadere, vista la sua bassa statura, quando si fermava ai semafori si avvicinava al marciapiede per appoggiare il piede. Anche in occasione del recente Record Store Day 2016 si era presentato al celebre The Electric Fetus dove ha acquistato i sui ultimi dischi. Musical superstar Prince Rogers Nelson could have lived anywhere in the world. But he chose Chanhassen. Unlike other Minnesota-born musicians, actors, and celebrities, Prince maintained his Minnesota roots, and made his home in Chanhassen. Wherever he toured and traveled around the world, he always came back to Chanhassen. He bought property and built a home off Lake Lucy Road in the early 1980s. While the home no longer exists, Prince still kept ownership of the property; he also built Paisley Park, his recording studio nearby, on Highway 5 and Audubon Road. Among the reasons Prince stayed in Chanhassen may be that the community didn’t treat him like a celebrity but as a member of the community. He dropped in for coffee at Caribou Coffee near Office Max, grocery shopped at 3 a.m. at the Chan Cub Foods, rode his bike on the local trails and into downtown Chanhassen, did his dry-cleaning in Excelsior, took in late night movies at the Chanhassen Cinema, and was seen pumping his own gas at the local stations. He even shared typical suburban concerns like how to keep the deer from eating his hostas, and complaining that local taxes were too high. Did you ever wonder, how Prince chose Chanhassen as his home and international headquarters for his world renowned music recording studio Paisley Park? According to Lee Clark of Victoria, a former Twin Cities realtor, a group of top real estate agents had an informal advisory board called “Distinctive Homes,” designed to provide a sounding board, and give advice to other agents. In 1982, Clark remembers an agent in the group was describing the difficulty in finding the right location for a high-profile client who was looking for a home. The obvious choices were around Lake Minnetonka: Ferndale, Wayzata, Orono. But none of those communities seemed exactly right. Where was she going to put him? The agents brainstormed: Eden Prairie, Hopkins, Minnetonka? The client was Prince, and he did buy Chanhassen property, on Lake Lucy where he built a house; later he bought property off Highway 5 and Arboretum Road, where Paisley Park is located. “Back in the late 1990s and early 2000s I worked at the Chanhassen Public Library. One evening, I answered a phone call from a librarian in a small community in one of the Southern states who was trying to solve a mystery. Her library had received an anonymous gift ($12,000) with no explanation, in the form of a very large check. The check had a Chanhassen address [7801 Audubon Road], and the account name was listed as Love 4 One Another Charities. I told the woman that I suspected that the donation came from our local purple royalty, Prince. The librarian explained that her community didn’t have money to sustain the arts and that she had difficulty in putting new books on the shelves of the library. She had no idea how Prince connected with her community but she told me that his generosity would make a huge difference. Editor’s note: Prince donated $12,000 by check dated Sept. 15, 2001, to the Louisville Free Public Library’s Western Branch Library, which in 1905 became the first library in the nation operated by and serving African Americans. The donation arrived in 2001 – but word of the gift spread only Thursday, after a Louisville library supporter posted about it on social media in the wake of Prince’s death. —Lauren Hugh, Chanhassen, a musical theater student at the University of Minnesota-Duluth. Jeff Peshek of Chanhassen sold a motorcycle to Prince. “I bought this motorcycle new in 1976,” Peshek said. 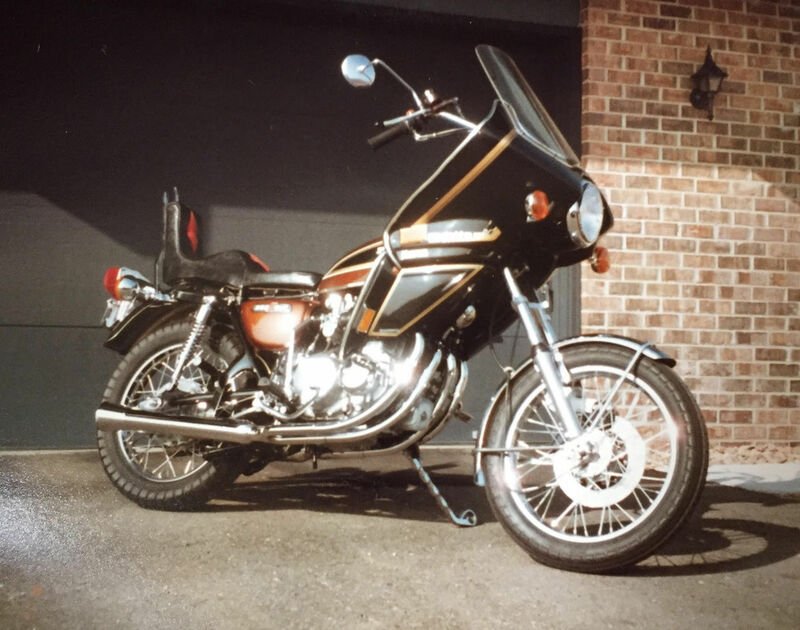 “It was a Honda 550… I rode this bike until my wife and I were expecting our first child. Barb (my wife) said, ‘Why don’t you sell it?’ So I put it out on Ray Kerber’s farm by Highway 5 and Dell Road. Within a couple hours, I got a call. Chick (Huntsberry), Prince’s bodyguard (who lived in Chanhassen Estates) came by with his wife and kids. “I was selling it for $1,200 and what impressed me,” Jeff said, “he didn’t try to talk the price down. Chick just peeled off a bunch of $100 bills. “I feel very fortunate that I spent the last couple of years working for Prince at Paisley Park. I started out thinking the music business was going to be easy. That was not the case. It’s quite a bit of work, but well worth the effort. “When people came to Paisley they’d sometimes ask what I do there. My answer was everything except share the stage with him. It would’ve been cool to one day play guitar with him, but it is what it is. “I did however set up his equipment, clean his bathroom, hauled out his trash, washed his dishes, and anything else that needed to be done. I absolutely love who Prince was as a person and it’s sad that we’ve lost such a great musician. The guitars, cars, and studios were amazing. Downstairs is his mysterious vault, and unfortunately, across from the vault is the elevator in which he was found. I’ve used that elevator several times to either go up to the offices or down to the cars below and it breaks my heart to think of him laying in there dead. “I know he suggested to be successful you have to not care what the crowd is doing and just be good at what you love. Be different and go against the grain. Don’t look too far into the future or dwell in the past because you’ll miss right now. “Prince had vision and was able to take his dream and turn it into reality. The fans were great and I see they’ve put some purple flowers on the fence paying their respects. I’m sure he’d be thankful. “The last memory I have of Prince is the night Madonna stopped by a few months back. After everyone left it was about 5 a.m. or so and here comes Prince on his bicycle with the biggest grin ever. He looked so happy and that made my day. “I was not of the generation enamored with Prince. My Minnesota musical ties are tied to that other musician from Hibbing a generation earlier. “With that said, Prince lived in the same community my family moved to 20 years ago; Paisley Palace is within a mile or so as the crow flies. Di lacrime per la averlo perso e per le cattiverie (gratuite) che si leggono ne sto versando tante… Con questo articolo mi hai fatto sorridere, grazie Simone. mi amareggia un pochino di piu’ vedere gente comune che non ha mai aprezzato Prince , rivendicare le cattiverie che in questi giorni rimbalzano tra i mezzi di informazione a mo’ di flash (affrettamente poi sparite , e mai rettificate) quasi a “giustificare” il loro mancato aprezzamento per l’artista. Malgrado non veda a prescindere una relazione tra il giudizio di Prince in quanto artista, e quanto si stia subdorando malignamente sulla sua vita privata (ma ricorderei che i Romani dicevano “onus probandi incubit ei qui dicit”, l’onere della p r o v a e’ carico di chi accusa), faccio veramente fatica a capire cosa di male abbia fatto il Genio a queste persone per emettere giudizi tanto negativi su di lui. Non vi piaceva (ne credo vi piacera’ mai) Prince ? Vi risulta essere un problema ? Il fatto che un artista riconosciuto universalmente come genio non abbia riscontrato il vostro aprezzamento vi infastidisce ? Non avete mai provato la Purple torta ? Va be’…….continuate pure a farvi del male ! Grande Pierfrancesco! Si a molti infastidisce il fatto di non aver mai assaggiato la torta…e anche se lo hanno fatto…non l’hanno apprezzata…direi che su questi figuri può scendere il nostro pietoso velo. PS: ma il tributo di ieri al Primo Maggio? mai sentita una zozzeria di quel livello. i fenomeni de noantri sono riusciti rovinare l’irrovinabile.